Antique cufflinks French 18K yellow gold mask: Description by Adin Antique Jewelry. 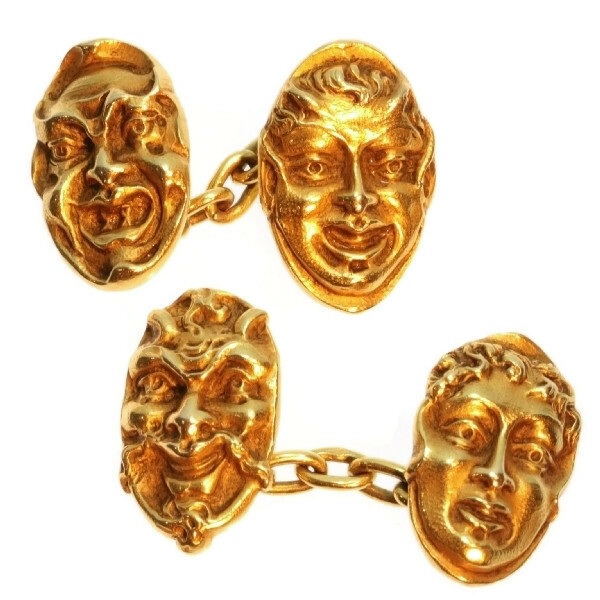 These unique 18K yellow gold French Victorian cufflinks from 1890 depict four grinning portraits resembling characters from Ancient Greek comedy and tragedy theatre. Through a cable chain, one cufflink connects assumingly a Satyr with horns and pointy ears to a devilish persona with pointed ears as well and fangs. As for the other cufflink, the portrait of a foolish old man with a moustache, a goatee and horns fit to impersonate Dionysos, the Greek god of wine, is hanging besides a feminine face with pointed ears resembling Medusa or a female worshipper of Dionysos. With even every backside individually modelled and with the finest hinges on the back, these masculine jewels are a sample of pure French sophistication, which will assist you in any performance in this play without rehearsal that we call life. Style specifics: Late Victorian / early Art Nouveau - The subject of this piece, although typical 19th Century, announces the coming of the Art Nouveau style. Extra information: These cufflinks are a strong representation of the craftsmanship of the medallists of the Late Victorian era in France. Designers continued to use this technique of engraving medals extensively during the Art Nouveau period. The manufacturing of this type of jewellery became so widely known and appreciated, that the makers deserved their own style division, called "the medallists".